Prohibition, inventory confiscation, the mob, and a mysterious (inside job?) warehouse fire brought the brand to an end. Fast-forward to current day — master-blender, and Great-Great Grandson, Dixon Dedman, brought The Wise Man’s Bourbon back to life and created one of the most coveted bourbons of our era. With this success it became clear that the brand needed a more refined and detailed package that captured the legacy and heritage of the Kentucky Owl brand, while at the same time, retained a small batch, craft-distiller aesthetic. 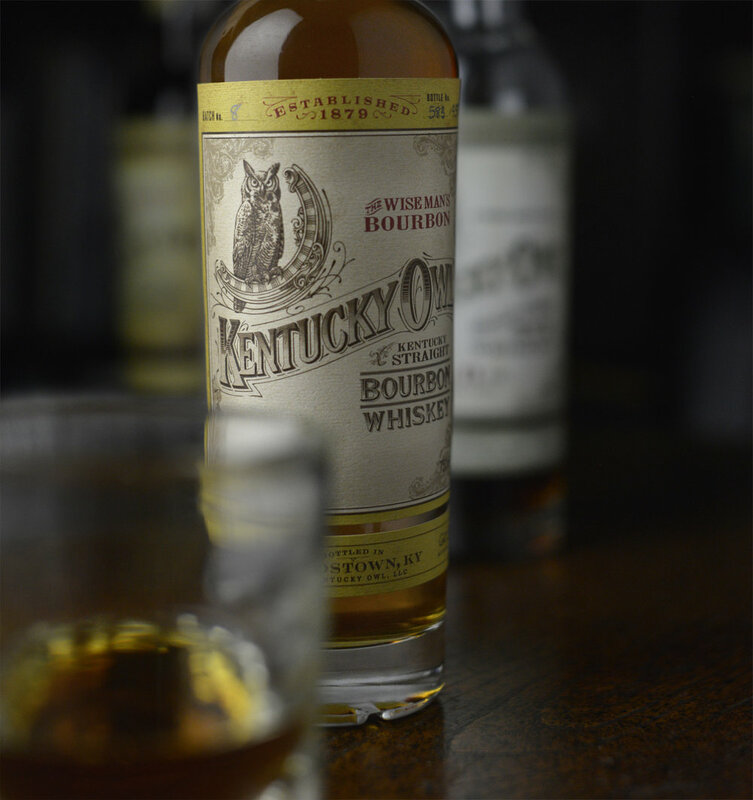 As stewards of this historic brand, our challenge with Kentucky Owl was twofold: first, improve and accentuate every element of the current package, while taking care to maintain core brand equities, and second, expand the Kentucky Owl brand to a new Kentucky Rye Whiskey. Each part of the package was reimagined, improved and enhanced to reflect the premium quality of what is in the bottle. With but a few lines of computer set type, detailed hand lettering and illustration make up the majority of the elements on this label, just as it would have been done in the late 1800s. The custom brand mark, iconic owl illustration, and border system are designed to be the graphic constants of the Kentucky Owl brand. They are the brand identity, and will act as anchors to new elements that might surround them on any future product offerings. Additionally, to more effectively communicate Kentucky Owl’s story and exclusivity, the information was subtly reorganized to highlight the established date, batch and bottle numbers, along with the distillation and bottling location — all important bits of information for collectors and connoisseurs. A special shout out and thanks to the attentive folks at Multi-Color Napa’s digital department for allowing us the time, and taking the extra steps necessary to deliver the look and feel that we set out to achieve with this design. The labels are printed on a HP Indigo 6600 digital press, then stamped on a ABG Digicon finishing unit. DeCrevel Die of Napa created the detailed hand sculpted embossing dies for the owl and brand mark, which, along with the texture of the Classic Felt Bright White stock, give the label a lovely tactile quality. We’re proud to have helped usher in a new era for Kentucky Owl and the Dedman family — we think we’ve achieved the goal of connecting the family’s rich history to the present day needs of a luxury Kentucky Bourbon brand. Check out the Kentucky Owl website to learn more about the brand’s interesting history, and what Al Capone may, or may not, have had to do with it. Special thanks to CCL Label, of Sonoma, CA for the fantastic print job, and to photographer, Paul Kirchner Studios, in Oakland, CA, for capturing the essence of the JUGGERNAUT. Wright and Brown Distilling Co.
Oakland’s first legal distillery since prohibition, Wright and Brown Distilling Company, came to ADG looking for packaging for their inaugural Whiskey releases. With an industrial West Oakland location, and milling, distilling, and barrel-aging done 100 percent on-site, the packaging needed to communicate Wright and Brown’s commitment to craft and the unique characteristics of their brand. To accomplish that goal, we elected to root the packaging in a time-period when there were many distilleries in Oakland: pre-prohibition. Our package channels the look of pre-prohibition whiskey packaging with an apothecary style that artfully packs in lots of information any whiskey connoisseur might need. The small batch nature of the whiskey is further reinforced by the sequential numbering for each bottle and batch. An aged wood-grain background communicates the importance of oak in the aging process of making fine whiskies. Elements like classic typefaces that are debossed in a letterpress-style, and the hand-lettered monogram, inspired by gun company monograms of the era, help create a brand image that is both evocative of the pre-prohibition era, but also timeless. Additionally, the inclusion of Oakland’s Tribune tower and shipyard cranes help give the whiskey a sense of place and connect Oakland’s past to Wright and Brown’s present. All the design choices reinforce the handcrafted origin and qualities of the whiskey, yet still gives the package a modern and high-end feel. Long-time client, Humboldt Distillery, came to us with a desire to create a Cannabis-infused vodka that would be a quality tribute to Northern California’s Emerald Triangle. The product would not feature any of the THC found in marijuana, instead it’s a product made with locally grown hemp that’s a subtle nod to the region’s pot-growing tradition. And that subtle nod had to remain subtle. Aside from the usual built-in labeling law limitations that go along with packaging alcohol, federal labeling laws strongly prohibit referencing, or depicting anything related to illegal drugs on alcohol packaging. So, in this case, it meant no pot plants, leaves, reefers, blunts, pipes or bongs — nothing fun. The challenge of evoking the essence of the local cannabis culture without any of the typical visual cues led us to go for a subtle hemp burlap sack texture in the background and a cluster of vegetation that “kind of” looked like marijuana plants. The first label version was rejected for stating “Cannabis Vodka” on the brand banner (a completely accurate description for the product), leading us to use “Humboldt’s Finest” on the front label – a reference for those in the know. This label is digitally printed on Neenah Packaging’s Estate Label #8 uncoated, pressure sensitive, substrate. It features a multi-level emboss. The first level is the hemp bag background texture; the second is our custom botanical & banner illustration. The final package is one that delivers the needed cues and Emerald Triangle spirit, yet still delivers a package that appeals to a wider audience. Legendary rap artist, E-40, (AKA Earl Stevens) got his name from drinking 40-ounce beers in his hometown of Vallejo, California. So, when he approached Auston Design Group about doing his own 40 oz. malt liquor we knew it had to be special. With a slightly higher price than the mainstream competitors, the charge behind the design was to create branding and packaging that communicates that the product is a higher-end malt liquor. The package was designed, not only to attract E-40 fans, but to catch the eye of the long-time malt liquor consumer and present them with something new and different. Malt liquor drinkers are a different type of consumer than the typical craft beer aficionado. The craft enthusiast is likely to have a go-to brand, but is always exploring and eager to try something new or different. In contrast, the malt liquor consumer is very loyal and tends to wear their brand of choice as a badge. With this in mind, we developed a brand image that had strong E-40 branding and could be recognized from across the room. The branding had to channel the essence of its creator – successful, strong and bold, with a hint of refinement. We achieved this through a minimalist design approach that presents the brand name in large bold type on a metallic gold background. Application of the 40-ounce label design to the 24-ounce can was a smooth and natural extension. It's not a craft beer, and it's not a traditional malt liquor, but through a bold and refined design, Auston Design Group was able to help E-40 build a strong brand and carve out a new market for his malt liquor. Carter Raff, Proprietor of Raff Distillerie, came to us for another San Francisco based packaging project — a Rhum Agricole inspired by San Francisco’s Barbary Coast. Born during the Gold Rush of 1849, the Barbary Coast was a neighborhood known for gambling, prostitution and general debauchery. It’s pretty much the perfect inspiration for a locally made Rhum. The Barbary Coast neighborhood was too cool and unique not to portray visually, so the package features a large illustration that captures some of what you might have seen on an average day in the Barbary Coast. The illustration itself is executed with graphite on paper and simulates the metal-plate etching print process of the era. The brandmark lock-up is hand-lettered in the style popular in the mid-1800’s, and simulates the period’s steel-rule engraving print technique. Repeat drinkers of this product might spot a few off-color easter eggs in the illustration as well. A vintage-style tax band featuring our old friend Emperor Norton (a mad street character of the Barbary Coast) acts as a tamper evidence seal. A special thank you to CCL Digital of Portland for helping us capture the intricate details of the package. Castello di Querceto had everything that one could want in an Italian producer — family-owned for five generations, a 13th-century castle, high-quality vineyards and winemaking. Yet, brand sales had been declining for several years. It was clear that Querceto’s packaging wasn’t effectively communicating their quality and brand story. The brand name translates to “little oak forest” and comes from the winery’s location in a wooded hillside in Tuscany. ADG was contacted to bring modern sensibilities to Querceto’s brand. By leveraging and highlighting aspects of the brand’s existing story our design solution is minimalist, with a contemporary typographical layout. The custom illustration is done in a 19th Century wood-engraving style, to create balance with the modern aspects of the label and pay homage to the long history of the brand. Rich in symbolism, the unicorn in the oak forest is representative of the unicorn in the family’s centuries-old coat-of-arms and creates a new iconic image for the brand. As with all ADG labels, printing techniques played a large role in the label coming to life. With this label, the debossed brandmark and sculpturally debossed illustration are indicative of the letterpress print method of a bygone era and help give the label a high-end tactile quality. A special thank you to the teams at Collotype Napa and Collotype Italia for their logistics and expertise. Martin Ray Winery’s Synthesis label offered Auston Design Group the unique challenge of visually representing an abstract concept. The wine itself utilizes Cabernet Sauvignon from lots in various Napa Valley sub-appellations to create a wine that is greater than the sum of it’s parts — thus, Synthesis. Visually, ADG represented the various Napa Valley lots through the series of small gradient and patterned circles. Individually, the circles’ intricate patterns are a visual metaphor to the textures and feelings one might get from drinking the wine. But together, the circles make up an abstract and modern twist on a complete cluster of grapes. The brandmark also expresses the idea of Synthesis. Through different typeface styles from the same type family, the brandmark brings together seemingly discordant parts to create something harmonious. Other details include a new Martin Ray Winery seal with both a deboss and a sculptured emboss. A special thank you to CCL Label for providing the expertise to execute all of the many details. Sonoma Valley’s Westwood Winery approached Auston Design Group to develop a new Pinot Noir-centric brand image and package design. The desire was to create a brand that was representative of the location and unique terroir of their vineyard plantings. A narrow passage at the top of Sonoma Valley, known as the Annadel Gap, keeps vineyard temperatures up by day, and draws in cooling maritime breezes at night. Westwood sought to leverage this unique terroir story, along with an air of understated elegance, to guide the process of branding and the designing of their packaging. While many options were considered, ultimately, it was the topographical map and compass rose, printed with metallic ink and intricately debossed, that give this brand both a sense of place and a high-end appeal. The addition of a hand-applied wax seal reinforces the exclusive nature of these small-lot wines. With wines of this caliber, it was also important to present technical information regarding growing conditions and winemaking details. This helped drive the clear and concise information design of the back label. While not conventionally exciting, these small details help communicate the value of the wine and are important to the serious consumer. Thank you to our friends at Westwood Winery for entrusting ADG with this interesting assignment and for allowing us use of their photography. Today, it’s a small quiet Humboldt County community named Freshwater, but around the turn of the century it was better known as Wrangletown. And while Wrangletown was small, it was anything but quiet — miners, loggers, and seven saloons, were the perfect formula to breed public disagreements. The proprietary, hand-lettered brandmark and the custom woodcut style illustrations were created to roughly reflect the old west look and feel of print design in the late 1800’s. The use of multiple typefaces also evokes the era, and gives the sense that the printer used every piece of wood-type in his drawer ­— not an uncommon practice back when printers doubled as designers. We think it all adds up to a “sorta refined, kinda classy” package. The label was printed digitally. Thank you to CCL Digital in Portland for their expertise. Sonoma County’s Dry Creek Distilling Co. presented Auston Design Group with the challenge of creating the brand image and package design for their new bourbon brand, Lost Republic. The only direction given was their desire for branding that represented a monumental three week span in California history; the California Republic. Also known as the Lost Republic, due to its short existence of only a few weeks during the summer of 1846. American insurgents declared their independence from Mexican rule by hoisting the new California Republic flag over the town of Sonoma. After 26 days the U.S. government had taken control of California. To reflect the era of the Bear Flag Revolt, a retro apothecary bottle was chosen and a die-cut golden yellow “tag”, representative of California’s golden hills, was used as the backdrop. Auston Design Group then created a number of period correct components for the label. Inspired by the California state symbol, the woodcut style California Grizzly Bear is recognizable from across the room, and has become the face of the brand. Other details like the brandmark, the debossed Lost Republic seal, a simulated rubberstamp seal, and a tax-stamp style tamper band, work together to evoke that 1846 Sonoma, California, sense of time and place. The pressure sensitive label was printed digitally on 70# Eggshell Felt stock, and the deboss and diecut were finished offline. Special thanks to David Bishop Studios in San Francisco for the beautiful photography. A well-established and trusted brand, Cline Cellars came to Auston Design Group for a redesign of their packaging system and overall brand experience. There was plenty to work with — a recognizable brandmark, a loyal following, a well-known location, and numerous wines. But it also featured the challenge of differentiating four very different tiers of wines under one unified brand. Our update brought together previous brand elements with new elements to help promote that Cline is a family-owned, Sonoma County winery. We developed a brand system to distinguish the four tiers — while still allowing them to compete within their specific categories and price points. Throughout the design process we worked closely with the Cline family and marketing team to make sure we accurately represented the personality of the brand and the winery. Cline’s California Classics received a redesign that positioned it as a serious, yet humble and approachable Sonoma County wine brand. Large brand name, color and the equity of their previous large script C were folded into the design. Support copy tells the story of Cline’s sustainable farming practices and family-owned history. This mid-tier crowd favorite is an obvious brand extension of the California Classics tier. Custom stamps depict aspects of the family’s history. A warm, earthy color palette lends a hand-crafted feel that helps communicate the fact that these wines are made with 100-year old vines. A higher-end line, sold primarily through the tasting-room and wine club, the Sonoma County tier was was inspired by many of the European varietals that grace this tier. We took a restrained approach to this design, utilizing classic French design cues like white space, beveled corners, Bordeaux red & Burgundy yellow capsules, along with high-quality bottles. Cline’s single vineyard series is also primarily sold through the tasting room and wine club. Our approach was to present the brand in the classic refined look of a well established, heritage brand; be it European or Californian. Textured paper, scalloped corners, elegant type layout, a debossed seal, and lots of white space position the Single Vineyard tier as a solid and trustworthy luxury product. The response from the trade and consumers has been overwhelmingly positive. And thus far, the sales back it up. Distributors are reporting an increase in sales to retailers by almost 10 percent. Thank you to CCL Label, of Sonoma, CA, for another great job of printing, and whose expertise helped deliver these perfectly printed labels on their rocking state of the art Gallus RCS 430 press. A limited seasonal release, the Einstök Arctic Berry Ale is a refreshing witbier that’s flavored with tasty arctic bilberries. It’s a summer time twist on the usual Einstök offerings — and we think this can is the perfect packaging for this refreshing summer ale. If you see one in a store near you, grab it — they won’t be available for long. With Dry Creek Vineyard’s rich history in Zinfandel, the winery was in need of a label that visually communicated their expertise, history and the strength of their brand. Since their last Old Vine Zin package was introduced, the Zinfandel market has expanded greatly, and Dry Creek Vineyard needed a package that stood apart, and avoided all of the expected visual tropes. To avoid the usual tropes, we sought inspiration from the time when Dry Creek Vineyard's vines were planted. A steam ship ticket from the 1910’s served as inspiration, helping provide fuel for a label that is rich in both winemaking and visual details. Design cues include a ticket style die-cut and weathered texture. Elements like the dry-farmed stamp and hand-written harvest date markings are variably printed so that they are positioned slightly different from bottle to bottle — giving the label an authentic individual hand-stamped feel. Visually engaging, this package presents information in a way that appeals to the average consumer, yet has all the technical specifications that a wine connoisseur loves — including information about the cork. It was our hope that this package could allow a wine-drinker to discover something new each time they came for a bottle. Special thank you to CCL Label of Sonoma — their expertise with their Gallus RCS 430 press helped us perfect each one of the detailed effects. Lloyd Distillery came to Auston Design Group with an idea for a handcrafted, small-batch gin that was inspired by California’s Central Coast and the memory of the distiller’s grandfather. The result? Bixby Gin. With a design that harkens back to pre-prohibition California, this bottle would be as at home in 1915 as it is in 2015. As the brand continues to grow, the Bixby Bridge and Central Coast references help capture the essence of California and give this gin a true sense of origin. Details including hand-written batch number, sequential bottle numbering and variable hand-stamped application help define this brand as a true artisanal offering. Special thanks to Tapp Label in Napa, who printed the label on their digital HP indigo 4600 press. Auston Design Group is proud to have once again teamed up with rap legend, E-40, on his branding and label design. This time around for his entry into the spirits world with his premixed Hurricane cocktail, Sluricane. Keep an eye out for the release next week! 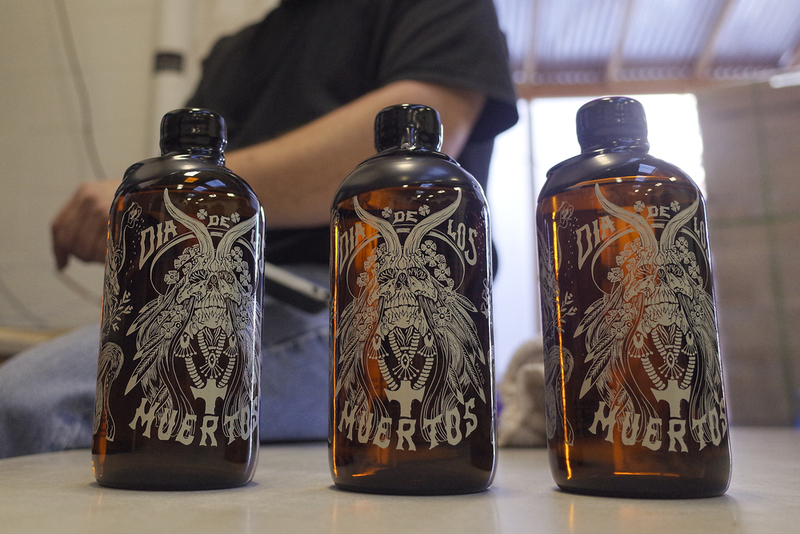 Last Year, on November 1st, Auston Design Group announced it's very own, Dia De Los Muertos Horchata Spiced Rum. A year later, we are happy to announce that we have successfully filled a single batch of 100 bottles to celebrate this years Dia De Los Muertos holiday. Our recipe is based on the flavors of Horchata, a traditional non-alcoholic rice milk drink of Mexico. Infused with Cinnamon and Vanilla as the dominant spices, it is crafted to be mixed with a sweetened milk of any kind and served on the rocks. It can be enjoyed equally well in any spiced rum cocktail. Dia De Los Muertos' limited edition inaugural release will only be used to celebrate Auston Design Group's 20th Anniversary that coincides this year.